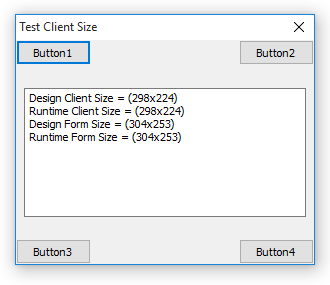 Delphi XE2 and later versions have a robust theming system that has a frustrating flaw: the client width and height are not reliably preserved when the theme changes the border widths for dialog boxes. For forms that are sizeable this is not typically a problem, but for dialogs laid out statically this can look really ugly, as shown in this Stack Overflow question. 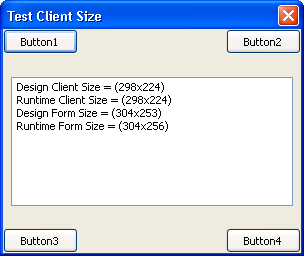 Here’s a little form, shown in the Delphi form designer. 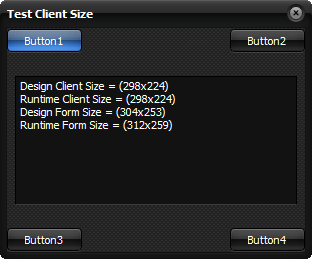 I’ve placed 4 buttons right in the corners of the form. I’m going to populate the Memo with notes on the form size at runtime. You’ll note that the vertical is adjusted but the horizontal is not: Button2 and Button4 are now chopped off on the right. Because we are using themes, the form looks identical on all platforms. This problem has not been addressed as of Delphi XE8. 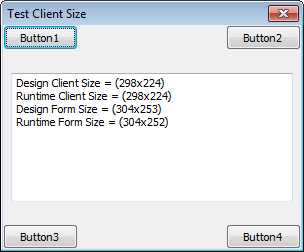 For my needs, I found a workaround using a class helper, which can be applied to the forms which need to maintain their design-time ClientWidth and ClientHeight. This is typically the case for dialog boxes. This workaround should be used with care as it has been designed to address a single issue and may have side effects. Setting AutoScroll = true means that ClientWidth and ClientHeight are not stored in the form .dfm, and so this does not work. 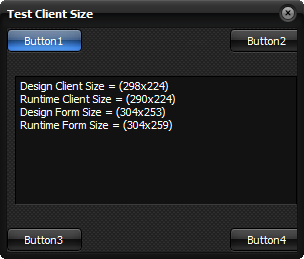 It may not address other layout issues such as scaled elements scaling wrongly (I haven’t tested this).